Saint John, born on the Island of Cyprus, was married, but when his wife and two children died he considered it a call from God to lead a perfect life. He gave away all he possessed in alms, and became known throughout the East as the Almsgiver. He was appointed Patriarch of Alexandria; but before he would take possession of his see, he told his servants to comb the town and bring him a list of his lords  meaning the poor. They brought word that there were seventy-five hundred of them, and these he undertook to feed every day. On Wednesdays and Fridays of every week he sat on a bench before the church, to hear the complaints of the needy and aggrieved; he would not permit his servants to taste food until the wrongs were redressed. A man whom he had helped thanked him for his assistance one day, but he interrupted him, saying: My brother, I have not yet shed my blood for you, as Jesus Christ, my Saviour and my God, commands. 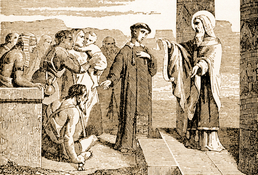 On another occasion, after he gave his habit to a poor man who passed by, a person he did not know appeared immediately afterwards and gave him a sack containing a hundred gold pieces. After that, when he gave an alms, he always said, I am going to see whether Jesus Christ will fulfill His promise of giving me a hundredfold. The accomplished promise occurred so many times that he ceased to say these words, which were, in any case, for the benefit of those surrounding him. Saint John never spoke an idle word. He put out of the church those whom he saw talking, and forbade all detractors to enter his house. He left seventy churches in Alexandria, where he had found but seven. A merchant received from Saint John five pounds in gold to buy merchandise. Having suffered shipwreck and lost all, he had again recourse to the Almsgiver, who said, Some of your merchandise was ill-gotten; and he gave him ten pounds more. But at the next voyage the man lost his ship as well as its cargo. John then said, The ship was wrongfully acquired. Take fifteen pounds of gold, buy grain with it, and put it on one of my ships. This time the merchant was carried by the winds to England, where there was a famine. He sold the grain for its weight in tin, and on his return to Egypt he found the tin changed to fine silver. Saint John was solicited to come to Constantinople to give his blessing to the emperor Heraclius, about to go to war against pagan neighbors; but the great bishop was called to his reward during the voyage, and died while praying on his knees, in Cyprus, his birthplace. The year was 619. The final resting-place of his relics was Presbourg, a city of Hungary, where they were transferred in 1632. Reflection. Is it not a grace which God gives us, to be able to help the poor, since every assistance given to the least of God's children is considered by Him as a gift to Himself? Let us ask Saint John for greater love for His poor. Little Pictorial Lives of the Saints, a compilation based on Butler's Lives of the Saints and other sources by John Gilmary Shea (Benziger Brothers: New York, 1894); Vie des Saints pour tous les jours de l'année, by Abbé L. Jaud (Mame: Tours, 1950). It is the spirit that gives life; the flesh profits nothing. The words that I have spoken to you are spirit and life.